Discover StrengthsFinder, the Assessment empowering 20,779,602 people to succeed. Join millions who use the CliftonStrengths assessment — formerly Clifton StrengthsFinder — to live their best life at work and everywhere else. Buy the assessment featured in StrengthsFinder 2.0, Amazon’s bestselling nonfiction book ever. 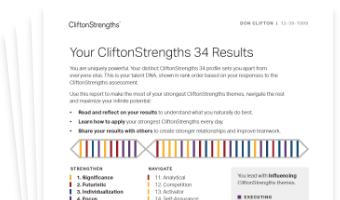 Compare the All 34 and Top 5 CliftonStrengths access codes to find the right fit for you. StrengthsFinder 2.0 and How Full Is Your Bucket? Redeem your access code from these two bestsellers. Have an access code from Strengths Based Leadership? Redeem your access code from Strengths Based Leadership. Need to redeem a code from one of these books? Click below to redeem your assessment access code from one of Gallup's earlier publications.